Boring baby costumes are a dime a dozen. Oh you're a bee? A dinosaur? Big whoop, kid. 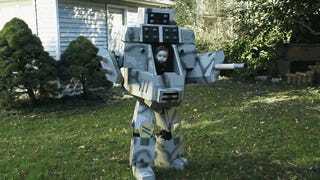 Try a MechWarrior costume on for size. My husband had this costume planned for several years, long before we had a child. The inspiration was a computer game he played in high school. When we found out we were having a baby, he got to work. Ryan sketched out the rough designs probably two months before Geraint was born. With so much baby stuff coming in the mail, we had plenty of boxes for him to work with, so he just had to buy a few things to make it. What a cool dad. You can check out the full gallery here.